Poolbeg Generating Station, colloquially known as The Poolbeg Stacks, is a power station owned and operated by the Electricity Supply Board of Ireland (ESB). There are two stations on the site, the older thermal station containing units 1, 2, and 3 and the combined cycle gas station containing units CG14, CG15 and ST16, which is located toward the eastern end of the site. The six units have a total installed capacity of 1020 MW. The plant is located on the Poolbeg peninsula in Ringsend, Dublin, on the south bank of Dublin Port. 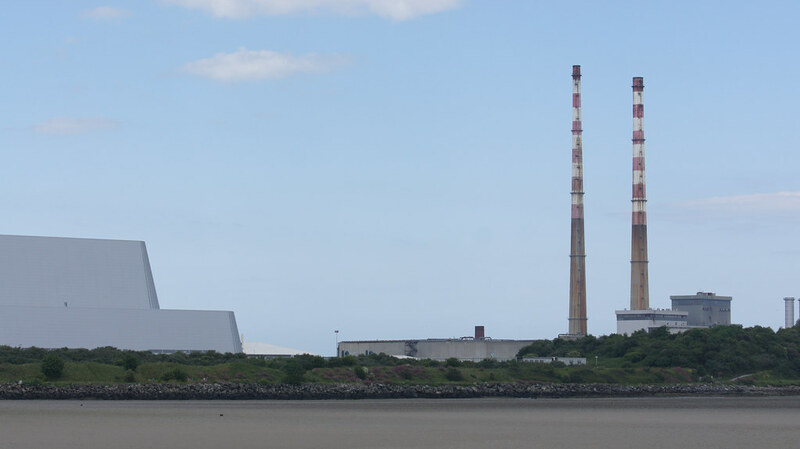 Its two chimneys, at just over 207 metres, are visible over much of Dublin, particularly Sandymount Strand, making them well-known landmarks and some of the tallest structures in Ireland. Poolbeg is situated adjacent to the now-decommissioned Pigeon House generating station, where electricity was first generated in 1903. The Pigeon House was previously a military barracks and the officers accommodation building still exists. It was used for power generation until it was decommissioned in 1976, and the Poolbeg plant is still known locally as the Pigeon House. The modern Poolbeg station was constructed in two separate phases, beginning in the 1960s. The ESB decided to construct the station in 1965 and the initial development was completed in 1971 with the construction of Units 1 and 2 at a cost of 20 million Irish pounds. The original Pigeon House generators remained on standby duty until 1976. Unit 3 was completed in 1978 at a cost of 40 million pounds. The combined cycle station was constructed in the 1990s. CG14 was commissioned in 1994, CG15 in 1998 and ST16 in 2001. The identical units 1 and 2 have a design output of 120 MW each. They both have turbo-alternators manufactured by Brown Boveri and 'drum type' boilers by Fives Penhoet, France. Unit 3 has a design output of 271 MW. It uses a turbo-alternator manufactured by Alstom, France and a 'once through' type Boiler by M.A.N Germany. Uniquely among power stations run by the Electricity Supply Board, all three units in the thermal plant can currently fire on oil or gas. Gas is supplied to the site by the Bord Gáis network. Oil is stored in five tank in the site's oil farm, with a maximum capacity of 140,000 tonnes. The CCGT plant has two Siemens V94.2A gas turbines (units CG14 and CG15), a HRSG and a steam turbine (ST16). When it opens in 2017, the adjacent Dublin Waste-to-Energy facility will supply the power plant with steam. In 2006, the ESB advised of its intention to withdraw approximately 1,300 MW of total Irish electricity capacity over the next five years. This effectively reduced the installed capacity of fully dispatchable electricity generation in the country from 6,437 MW to 5,150 MW by the end of 2010. This 1300 MW closure, was aimed at the older inefficient power stations in Ireland, the 60% average generation availability between 2002 and 2005 that was produced by the 3 thermal units, units which amount to 461 MW of combined electricity capacity at Poolbeg Generating Station Dublin were to close, while the newer 460 MW combined cycle fossil gas turbine at Poolbeg would remain operational. The thermal station chimneys are among the tallest structures in Ireland and are visible from most of Dublin city. Number 1 chimney is 207.48m (680 ft 9in) high. Number 2 chimney is 207.8m (681 ft 9in) high. The chimneys are featured prominently in the video for the song "Pride (In The Name Of Love)" by U2. Dublin City Councillor and historian Dermot Lacey began a process to list the chimneys for preservation to safeguard their future after the Station was to close in 2010. This was later refused by the Council Planning Department. They were subsequently listed as protected structures in July 2014. The Dublin Waste-to-Energy Facility, also known as the Poolbeg Incinerator, is a waste-to-energy plant serving the Greater Dublin Area, and located on the Poolbeg peninsula. The plant will produce 60 megawatts of electricity, enough to power 80,000 homes, and provide district heating for up to 50,000 homes in the area.The facility will process 600,000 tonnes of waste per year. The proposal to build an incinerator at this location provoked controversy since its inception in 1997 with concerns about traffic and emissions, but construction work finally started in 2014 and the plant took its first delivery of waste on 24 April 2017. On June 8, 2017, eleven people were hospitalised after an ‘uncontrolled release’ of lime inside the flue gas treatment area inside the plant. Covanta, the operator of the plant, was ordered to temporarily cease the incineration process at the facility by the Health and Safety Authority.